There is a lot to love about Epilay’s Protectite line of synthetic underlayment! These underlayments are designed to replace traditional felt underlayment. For instance, if you’d normally use 15-pound fabric, then you’d want to use Epilay Superior, which is a 7-mil underlayment. Protectite Ultra, at 11 mils, replaces 30-pound underlayment, and the Platinum grade replaces D226 underlayment. If you’d like to learn more about the key features that make Epilay’s Protectite line better than traditional underlayments, we’ve outlined three of the top features below! One of the things that makes these underlayments safer to work with is the GripWalk top layer, which is a non-woven fabric layer. Non-woven fabric increases safety by reducing slippage—the materials fibers grip to the soles of boots and shoes, which reduces the risk of slip-and-fall accidents. Protectite underlayments feature a grip on the back of the underlayment. This is an important safety feature (and it helps with installation) because the grip helps hold the underlayment in place even if it hasn’t been fastened yet. This means that it has much better walkability overall than traditional underlayment. The grip layer also means that you can use fasteners that you may not necessarily be able to use with other types of underlayment, such as standard coil nails. This makes installation a lot easier since the nails can be placed with a nail gun, saving roofing contractors both time and money. Protectite’s design gives it a much higher tear strength than traditional underlayments, and this helps roofers in a couple key ways. 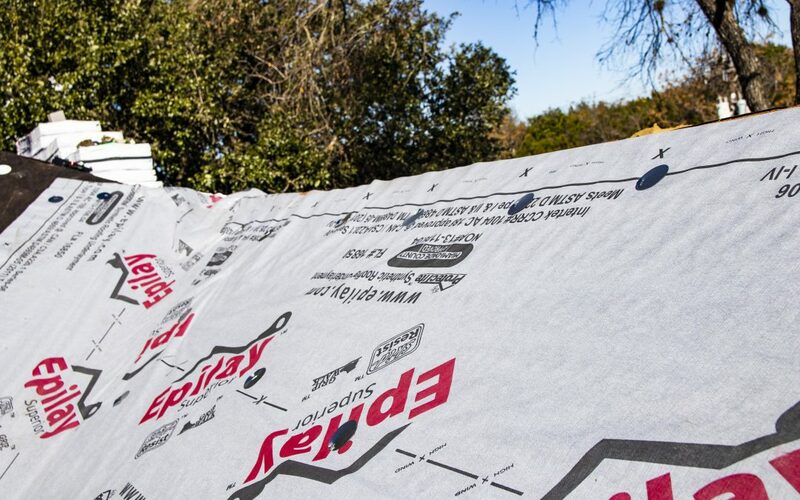 First, the high tear strength means that tearing isn’t an issue when the underlayment is being rolled and fastened—in other words, less wastage throughout a roofing job! Additionally, the increased tear strength means that delays are less problematic because the underlayment is less prone to wind damage. Typically, as a roof is being installed, it’s imperative to get the roofing material placed quickly so that the underlayment doesn’t blow away or suffer UV damage. When roofing materials don’t arrive on their scheduled delivery date, this can be a headache for the roofing contractor. But, Epilay’s tear strength and 365-day guarantee against UV exposure means that roofers using it will have peace of mind where delays are concerned. Protectite has lots of other features that make it a wonderful alternative to traditional roofing felt. If you’d like to learn even more, check out the video below!